MCT's 1QFY3/19 DPU of 2.23 Scts is in line at 24.7% of our FY19 projections. Strong performance at VivoCity, with positive rental reversion. Office rents should stabilise in tandem with the positive market outlook. Maintain ADD with an unchanged Target Price of S$1.75. 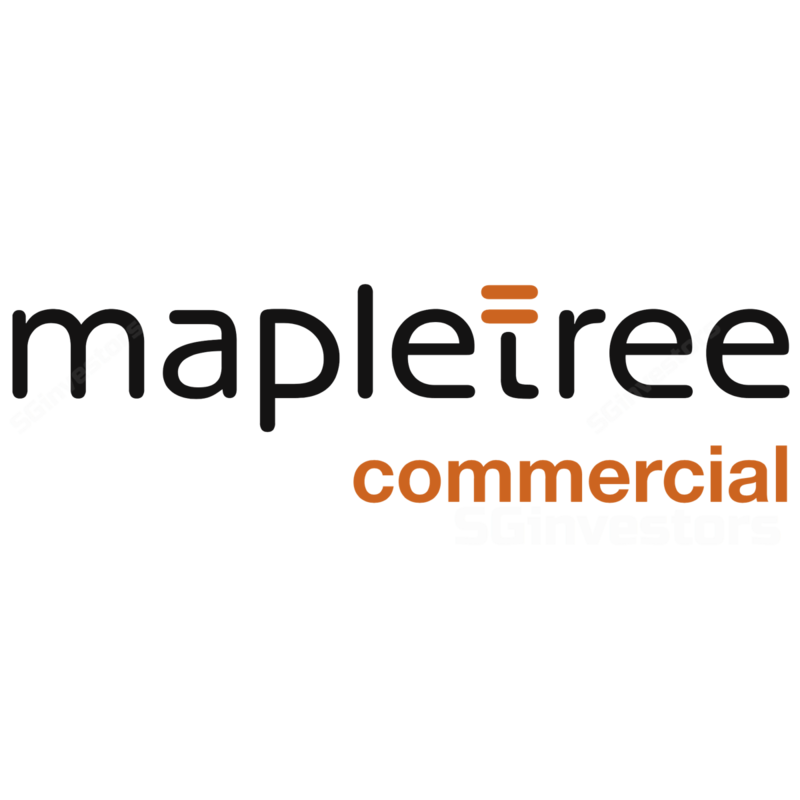 Mapletree Commercial Trust (MCT) reported 1QFY3/19 gross revenue of S$108.5m, up 0.7% y-o-y on the back of higher contributions from Merrill Lynch HarbourFront (MLHF), PSA Building and Mapletree Business City Phase 1 (MBC I), albeit partially offset by lower contributions from Mapletree Anson and VivoCity. Net property income grew a faster 2.1% y-o-y due to lower expenses for utilities, property maintenance, and marketing and promotion. Distribution income rose a slight 0.4% y-o-y to S$64.6m but DPU of 2.23 Scts was flat y-o-y due to the larger base number of units. VivoCity's revenue (46.7% of 1QFY19 revenue) dipped 0.2% y-o-y due to lower advertising and promotion revenue, though partially offset by higher rental income despite the downtime from its ongoing asset enhancement initiative (AEI). Occupancy rose from 93.1% in 4QFY18 to 94.2% in 1QFY19 while committed occupancy stayed high at 99.9%. Tenant sales declined 4.1% y-o-y due to the ongoing AEI; shopper traffic grew 0.4% y-o-y. Given the ongoing effort to refresh the mall, we anticipate continued positive renewals for the leases expiring in FY19/FY20F, which account for 7.5%/14.3% of its rental income. Rental reversion rose 2.1% in 1QFY19. Merrill Lynch HarbourFront (MLHF)'s revenue rose 12.2% y-o-y to S$4.9m amid full occupancy while the rental from PSA Building (+1.9% to S$12.7m) and Mapletree Business City I (+0.6% to S$31.6m) were driven by the effects of step-up rents in existing leases. Mapletree Anson’s rental declined 1.1% y-o-y due to lower occupancy, which offset the effects of step-up rents in its existing leases and compensation received. Office segment’s negative rental reversion of 5.3% in FY18 was due to the reversion of expired rent for a small portion of its overall office NLA to market rate. Including a rent review by a key tenant at Mapletree Business City I for ~195k sq ft, Mapletree Commercial Trust's overall office rent reversion only dipped 0.1%. A further 11.5% of its office rental leases are due to be re-contracted in FY19-20F. Gearing increased 0.2% pts q-o-q to 34.7% at end-1QFY19. Interest cost inched up to 2.91% from 2.75% in 4QFY18. 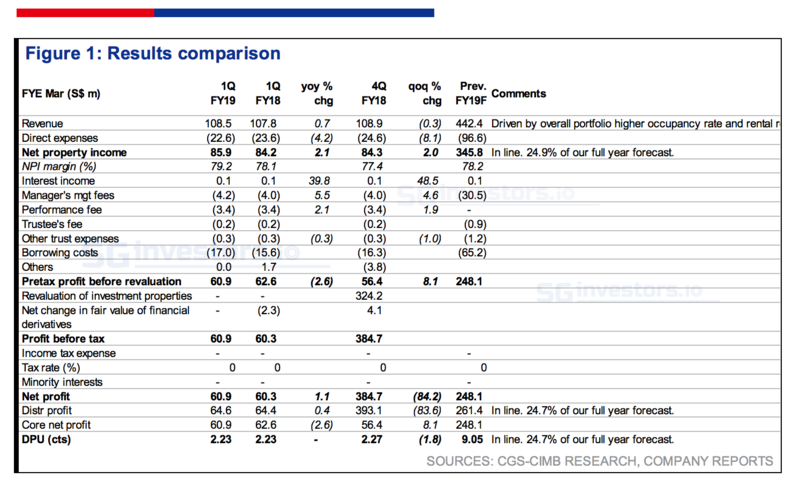 Some 75.3% of Mapletree Commercial Trust's debts are on fixed rates. The trust has a remainder S$144m to be refinanced in FY19F. We anticipate that overall interest cost could inch up marginally in FY19F, given the rising interest rate environment. We keep our DPU forecasts and DDM-based Target Price of S$1.75. We expect earnings to remain stable, underpinned by improved portfolio occupancy, as well as good VivoCity performance and earnings contribution from its newly-reopened B1 and upcoming opening of level 3 (currently undergoing fitting-out). The entire AEI in the mall would deliver ROI of ~10% once the performance of the refurbished space stabilises. Office portfolio should improve in the medium term, led by better office rental rates. Potential re-rating catalysts are further asset acquisitions and downside risks are worse-than-expected retail and office rents.